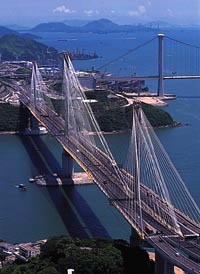 Despite the economic downturn, a long record of fiscal prudence has allowed the government to press ahead with a new phase of infrastructure development which will greatly improve access to urban areas and the northwest New Territories, open up new land for development and improve the quality of life in Hong Kong. The projects will boost Hong Kong's position as a regional transport hub and provide tens of thousands of jobs. The five-year, HK$235 billion (US$30 billion) commitment will cost 50% more than the 10 Airport Core Projects, which took seven years to complete. 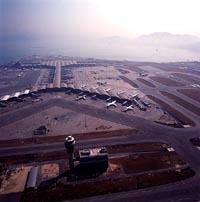 The new Hong Kong International Airport opened to air traffic on July 6, 1998, after an overnight move from the old airport at Kai Tak in one of the world's biggest peace-time logistical operations. The new airport - on a largely man-made 1 248-hectare island off the north coast of Lantau Island - has since established a reputation as one of the world's most modern and efficient. Its design and facilities have won accolades from tourism industry writers and engineers. The airport site is about the same size as London's Heathrow and is the only one in the world to have every frontal gate capable of taking a 747 aircraft or larger. Baggage reclaim, Immigration and Customs clearance times are all faster than at Kai Tak. There are fewer departure and arrival delays. There is a much greater choice of retail and catering outlets. It is far more spacious and comfortable. It is easily accessed on a new integrated transport network of roads and railway lines serving the urban areas and beyond. The airport's second runway opened to scheduled services on May 26, 1999. This allows greater flexibility in airline scheduling around peak arrival and departure times and increases the flight capacity of the airport. Full service of the runway is expected in August 1999. A new daily record of 117 000 passengers and their baggage was set on February 21, 1999, during the peak Lunar New Year period. The previous passenger record of 100 000 passengers in a day - set on December 27, 1998 - was surpassed on February 13, 14, 19 and 20. Record baggage handling efficiency was set on February 13, when 96 000 bags were handled compared to the normal daily throughput of 60-70 000. Only 25 bags were 'short-shipped' or missed the scheduled flight. The highest number of flights on a single day was 560, set during the Easter holidays on April 2, when an additional 123 flights were scheduled. The airport opening was initially marred by technical and teething problems in the passenger terminal, which affected baggage handling, flight information displays, lifts and escalators and even the public toilets. These were largely rectified within a fortnight of opening. Air cargo handling was more seriously affected by problems with the automated handling system at the new 'Super Terminal 1' operated by Hong Kong Air Cargo Terminals Ltd (HACTL). This forced HACTL to re-open its air cargo facility at Kai Tak until the new terminal at Chek Lap Kok - one of the world's biggest - was running smoothly. By August 24, all incoming and outgoing air cargo was being handled at HACTL's new Super Terminal 1. All three reports were released within the first quarter of 1999 and, in varying degrees, highlighted areas where communication and co-ordination between the government and the Airport Authority, and within the Airport Authority itself, should have been better. The government has taken the criticisms on board and will bear them in mind if a similarly large undertaking is attempted again in Hong Kong. The new airport has an initial capacity of 35 million passengers and 3 million tonnes of cargo a year. On full development, it will be able to handle about 90 million passengers and 9 million tonnes of cargo a year. Hong Kong has one of the world's busiest and most efficient container ports. It is privately owned and operated. Container throughput in 1998 rose slightly over 1997 - 14.7 million twenty-foot equivalent units (TEUs) compared to 14.5 million in 1997. This made Hong Kong the second-busiest container port in the world in 1998 after Singapore. Hong Kong had held the top position from 1992-97. A new Container Terminal No 9 (CT9) is under construction to meet expected demand in the early years of the next century. The first berth of CT9 is currently due to come into operation in 2002. Upon completion, CT9 will increase Hong Kong's container terminal capacity by more than 2.6 million TEUs per year. Future terminals are planned for the early years of the next century. The first purpose-built River Trade Terminal at Tuen Mun began operations in October 1998 and will be fully developed by late-1999. New mid-stream depots at Stonecutters Island also opened in 1998. There are proposals for a second river trade terminal at Lantau Island, deep waterfront industries at Tseung Kwan O and Tuen Mun, and mid-stream sites at Tsing Yi and Lantau.